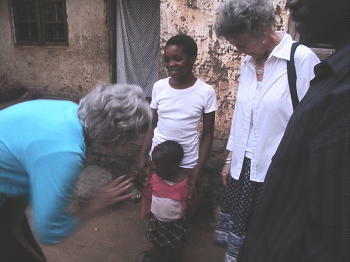 Sinta is an orphan with a child called Alice lived in abject poverty in Lilongwe, Malawi. 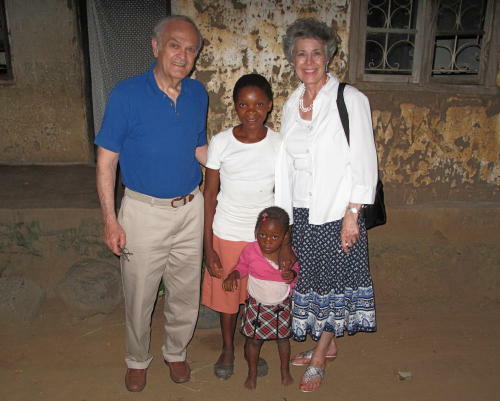 On April 10, 2012 Bev and I along with Denny and LeeAnn Luker visited her in her hovel in a busy part of the capital city of Malawi. 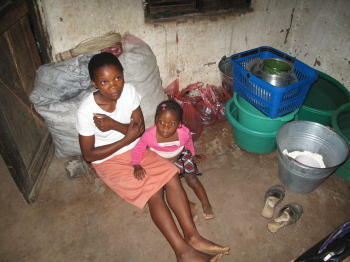 LifeNets helps support orphan Sinta and her daughter who live in extreme poverty in Lilongwe, Malawi. 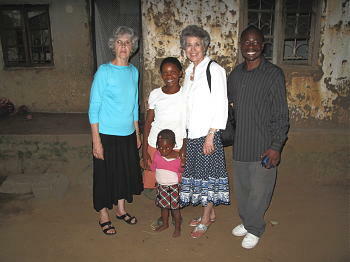 She is seen with Dennis and LeeAnn Luker who visited with her on April 10, 2012. To make a little money, she collected scraps of wood that she would sell. She was featured on local television program about poverty conditions in Malawi and people donated her some food and household items. But, once it was known that was on television, thieves discovered her and stole all that she had. In May 2012, she was visited by two American familes from Colorado: Barry and Sandy Kortius and Scott and Collette Lockwood along with their children Michala and Kiersten. By this time she was able to move to a Habitat for Humanity home which was arranged by Wordsworth Rashid. LifeNets had been paying her rent and providing a much needed improvement of living status. I first met Sinta Josaphat in January 2012. Sinta is one of the many orphans the deplorable conditions of Mawali too often produce. Mawali is a small, very peaceful country in south-central Africa. While Sinta is a tiny woman (standing less than 5 feet tall), she is as strong and courageous as anyone I’ve ever met. 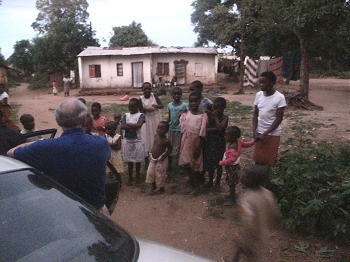 She grew up in a small village just outside the capital of Lilongwe. At the age of 14 Sinta was orphaned and left the responsibility of taking care of her 3 younger siblings. She dropped out of school and worked various jobs to keep food on the table. Sinta has shown tremendous maturity and love for her siblings. 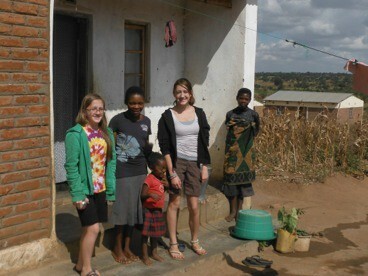 Sinta eventually left her village and moved to Lilongwe for better opportunities. She left her siblings in the care of distant relatives while still providing assistance for them. 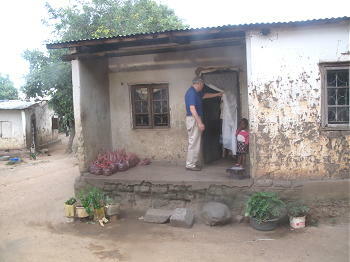 Sinta’s couragous story made National news in Malawi although few have the means to provide assistance. LifeNets, true to its motto, is making a difference in Sinta’s life. In February, LifeNets provided Sinta with a place to stay (small 2-room house built by Habitat for Humanity) and a small subsidy. Sinta is using this opportunity to go back to school to complete her education. She goes to school during the day and works evenings and weekends selling coal for cooking fuel. Sinta has been an example of courage and love for others. I hope we can all learn from this example. 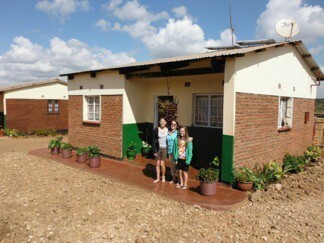 The Lockwood's and Kortius's wrote a report after their May 2012 trip and said this about their visit. 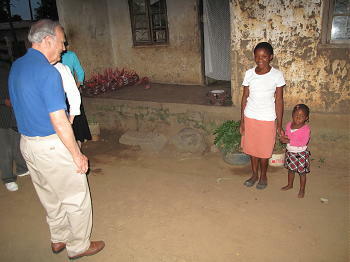 You can see their full diary of their wonderful May 2012 visit to Malawi here. Next, we drove a couple of streets over to visit Sinta Josophat and her thre year-old daughter, Alice, at their home. Sinta is 18 years old. Her home was a similar built home to Wordsworth’s home with one-bedroom plus a sitting room on a smaller lot. If our understanding is correct, Sinta’s housing is taken care of by LifeNets for approximately $10 per month. They recently moved Sinta closer to the Rashid family so that Roselyn could help take care of Alice. Wordsworth called Sinta’s schoolmaster to let him know why Sinta would be late to school due to us visitors arriving mid-morning. The state provides full schooling for Sinta plus nursery care during school hours for Alice. Sinta also sells firewood and charcoal in the neighborhood for extra income. We saw Sinta’s maid there at the house and in services on Pentecost, but cannot recall her name. Her maid helps with washing clothes and looking out for Alice. The Lockwoods had given Sinta and Alice clothes that use to fit Michala and Kiersten and Sinta was very grateful for the clothes. After we left, we heard that little Alice was giving Sinta a hard time not wanting to wear her everyday clothes but only the new “Mzungu” clothes. Malawi Trip Report May 2012 – Korthuis 20 The Korthuis’ delivered a gift from Marilyn Magoon to Sinta and Alice of crayons, animal coloring books, and an ABC coloring book. Sinta and Alice were grateful for the gifts. Sinta in her old home sitting on bag of charcoal which she will sell. Sinta's old dwelling. Denny Luker entering.